In this chapter we will cover the mechanisms that can be used to obtain services and use them programmatically. 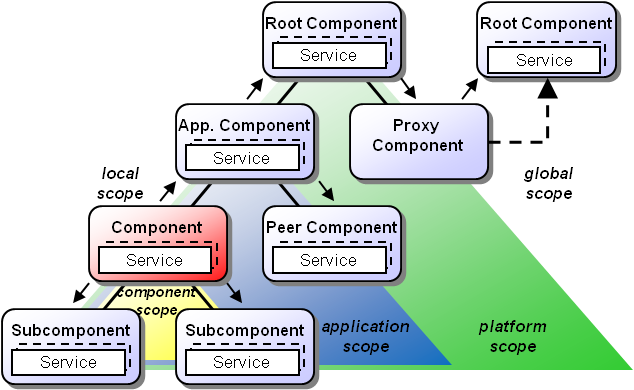 In active components, services are part of components and consist of an interface specification and a service implementation. Service interfaces are defined as Java interfaces and implementations as corresponding Java classes. Required services allow specifying in a declarative way how the service we need should look like and how the systems can find such a service. These aspects of how to find a suitable service are defined in the service binding. Such bindings can either be static, i.e. once the required service is bound it will not change from call to call, or dynamic meaning that it will be rebound each time the required service is accessed. In this exercise we will fetch the clock service. The clock service is already provided by the platform component itself so that it is sufficient to define that the service interface is named jadex.bridge.service.types.clock.IClockService and that it can be found within the platform scope. Add a required service description that defines the name of the service as clockservice, its type as IClockService and its scope as RequiredServiceInfo.SCOPE_PLATFORM. To understand the code it is necessary to explain the underlying concepts of the component service container. Each active component (regardless of its type) contains a service container that basically fulfills three aspects. It allows for fetching required services, searching services, and providing services. If you're using the JCC, you can see the service container below your running component). In this lecture we will use the clock service to print out the current platform time. Create a Java class called ChatC2Agent.java by copying the agent file from the last lecture. Insert a field of type IRequiredServicesFeature and name it requiredServicesFeature. Add an @AgentFeature annotation above the field declaration. Jadex will notice the annotation and automatically inject the corresponding micro agent feature object to the agent. In this case, the injected feature provides access to the declared Required Services. Read more about Component Features here). Declare a public void method called executeBody() and add a @AgentBody annotation above the method. This annotation is one of three lifecycle annotations) of a micro agents which will contain the functional agent code. It is called once after the agent is born. The declared service is looked up via its name using the RequiredServicesFeature's getRequiredService("clockservice") method. Fetching a required service makes Jadex inspect the binding definition of that service and possibly initiates an implicit service search. As resolving the binding may involve complex lookups it is realized as asynchronous call using a future return value (also nearly all services are defined this way). This means that the call immediately returns the future that represents a holder for the 'real' return value. The future allows the caller to be decoupled from the action of the callee because the method call can return without waiting for the callee to finish processing and the result is set by the callee whenever it is ready. (For further details on futures e.g. refer to Wikipedia ). The caller can add a listener on the future to be informed when the 'real' result is ready. Here a DefaultResultListener is used, which requires only one method to be overridden called resultAvailable(). The result is of type IClockService, on which calling the getTime() method delivers the current time in millis. This time is printed out to the console. (In contrast to System.currentTimeMillis() the platform clock could also return other times, e.g. when Jadex is used in simulation mode). In this execise we will use another service of the platform and invoke a method on it. In contrast to the clock service, which offers only normal synchronous method signatures, the component management service used here has an asynchronous interface. Create a Java class called ChatC3Agent.java by copying the agent from the last lecture. Change the required service specification to look for the IComponentManagementService.class and change the name to cms*. The scope can be kept the same as this service is also made available by the platform component itself. Adapt the getRequiredService() call to use the new service name cms and type IComponentManagementService. Change the parameter type of the resultAvailable method to IComponentManagementService. Invoke the getComponentDescriptions() method on the service to get an array of all components in the platform. Note, that the call returns a future so that you will have to add a result listener again for result processing. Iterate through the retrieved IComponentDescription array and print out the results one by one. Start the platform and the agent and check if the component descriptions are printed out. The output should look similar to the console snapshot shown below. Please note that the component management service is one of the central services of the Jadex platform. It can e.g. be used to create, kill, suspend and resume components. Feel free to inspect the IComponentManagementService interface to learn more about theses functionalities. Please note that, besides the interface type itself, the most important factor of searches and required service specifications is the search scope. It defines the area of the search and is per default set to application. This means that only components within the started application are considered within the search. Knowing this it becomes clear why we had to change the scope to platform in all lectures so far. Otherwise the search would have stopped at the application component and the platform services would not have been found. In the figure below a visual representation of search scopes is given. In general, the services used by a component should be made explicit by declaring required services in the component model. By default the required services are assumed to be static and therefore search a service only once and subsequently returns the cached value. (This default behavior can be changed by setting dynamic=true in the binding). In rare cases one might want to search for services directly. This can be done by fetching the required services feature and using the searchService methods. An alternative that can be used if really fine-grained search control is necessary is using the jadex.bridge.service.SServiceProvider class, which provides many static methods for searching services. In this lecture we will search for the micro agent factory service of the platform. This is not directly possible using a required service definition, because the platform has several component factories with the same interface IComponentFactory. (As an alternative one could use a required service binding for all services of type IComponentFactory and select from those). So what we need is a possibility to further restrict the search results. This can be done using a jadex.bridge.service.IResultSelector. For component factories there is already a ready to use selector called jadex.bridge.service.component.ComponentFactorySelector. Create a Java class called ChatC4Agent.java by copying the agent from the last lecture. Delete the required service annotation. Inject the agents internal access be creating a field of type IInternalAccess named agent and add the @Agent annotation to it. After starting the component on the console the output should indicate that a factory was found that is capable to load micro agents. Depending on the platform configuration this could either be the MultiFactory or the MicroAgentFactory.